Riff your way through this psychedelic rock-god adventure. 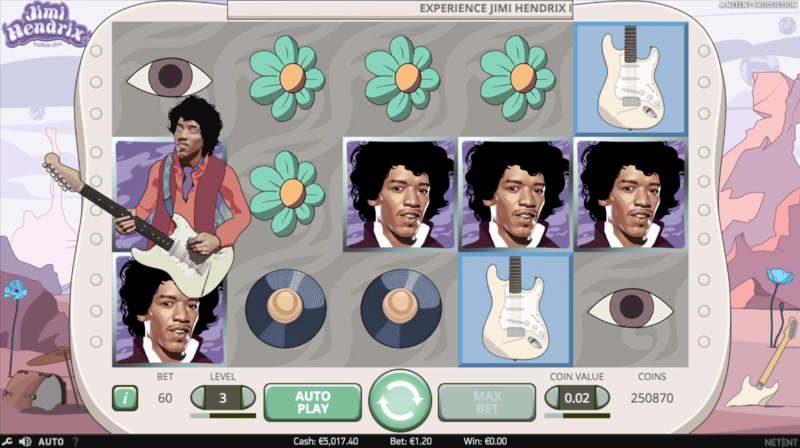 The purple haze has ascended and Jimi is waiting to taint you with these 5 reel slots play. Enjoy free spin bonus rounds featuring iconic Hendrix tunes Crosstown traffic and Little Wing. 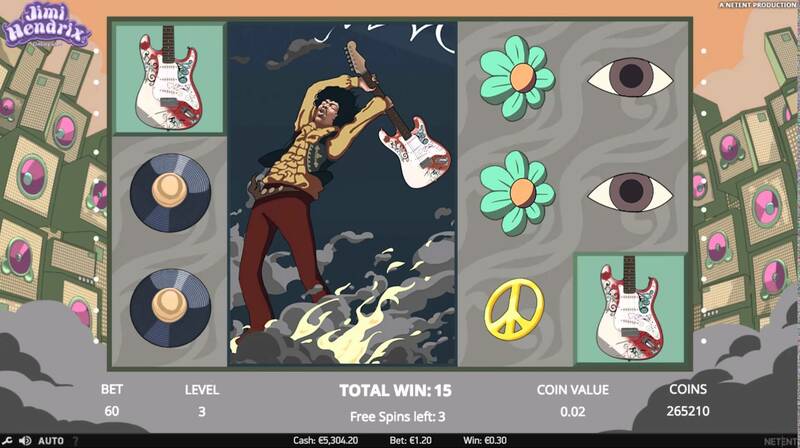 Here’s a great slots game for fans of the great guitar slinger Jimi Hendrix, or indeed for any rock music, or online slots lovers! Net Entertainment developed the game and we think you will love it if even just for the groove-tastic soundtrack and rocking guitar riffs of the master! What could be better than playing a slots game based entirely upon the late great Jimi Hendrix, possibly the greatest guitarist ever! We think Jimi himself would be shouting from the Watchtower to get you to give this game a spin. Jimi was a total legend and this slots game is heading the same way! Come one and have a jam with Jimi and the Wizard! Net Entertainment takes the credit for this inspired game. They have a great pedigree and some amazing games on the market, and this one just made it near the top of our list. Here at Wizard we work very closely with Netent. The content and design in this game are amazing and the tunes are the icing on the cake. This is an amazing slots game with 5 reels, three main rows and 20 fixed paylines to play on. 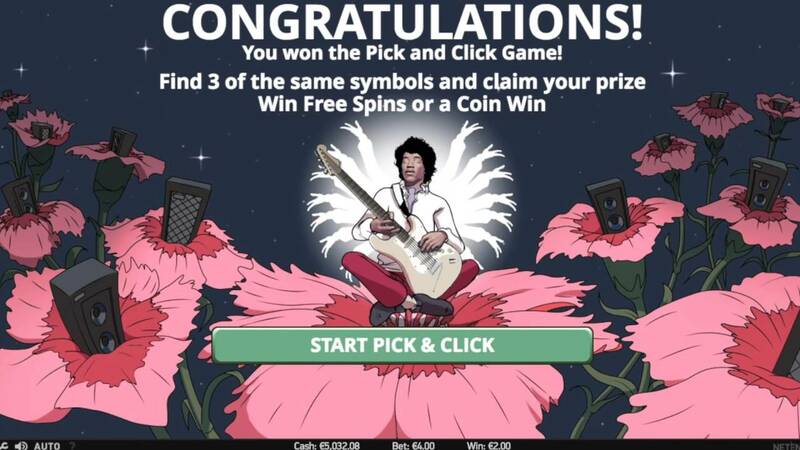 As you’d expect the main attraction of the best UK slots game is the main man himself, the maestro that was Hendrix, the genius guitarist and songwriter responsible for songs such as All over the Watchtower, Purple Haze and Cross Town traffic. It is no surprise therefore that the backing music to this slots game is beyond amazing, in fact totally awesome dude. You must turn your speakers up to really benefit from the soundtrack and rocking tracks. Betting on the game ranges from between 20 pence all the way up to an amazing £200, so be a little careful when placing those bets, to make sure you stay on budget. The rocking thing is that you can win up 400 times your original wager so Jimi Hendrix will be shining down on you with a win that big! This slots game has an amazing animated intro complete with the legendary music of the great guitar maestro, so you will definitely be rocking and ready to play. The somewhat strange choice of a desert backdrop might seem slightly odd, but it actually suits the rest of the game really well, so adds to the experience rather than detracting from it. The symbols on the reels themselves are, as you might expect, musically related, with musical notes, classical records and the peace symbol all being there. As usual with Net Entertainment games there is an autoplay feature for those who would; prefer to sit back and enjoy the tunes and lets the slots game do the hard work, making those spins! The bonus features are also rocking, the first of which is represented by Jimi’s famous white Fender Stratocaster electric guitar, as the scatter. This feature is called Pick and Click and is activated by landing on three of the guitar symbols on any three, four or even five reels. This engages a picking game that you play until you have three corresponding symbols, which in turn will award several bonuses. These can include a range of free spins or even some multipliers. The second feature is based on the classic song Purple Haze and if you land the Purple Haze symbol anywhere on reel one then you will be rewarded with the icon becoming wild along the reels and a bigger pay-out being calculated. This is loads of fun. The other feature is a play on the classic Jimi Hendrix song Purple Haze and the associated Purple Haze Symbol. If you manage to land the purple haze symbol anywhere on reel one then you will be rewarded with the symbol being “wild” along the reels and a bigger win being calculated. We really enjoyed this extra bonus feature, it’s a lot of fun.